Young Insia ( played by Zaira Wasim ) is a muslim girl growing up in Baroda ( Vadodara ) in the Indian state of Gujarat , and is the apple of the eye of her mother Najma ( played by Meher Vij ) . Mother is a liberal at heart and supports her daughter's love for singing with guitar , and even buys her a laptop by selling off her necklace so that she can upload the songs she sings on youtube . But the life of both mother and daughter is clouded by the presence of the head of the family---Insia's father , who is not only stern but is violent and beats her mother if she dares disobey him . Though at first he seems to be supportive of Insia's education to the extent of tearing apart the strings of her guitar because she does not get enough marks in school , he turns more and more backward as the film progresses . So the songs that Insia uploads on youtube have to be with her face covered by a burkha ( hijab like garment ) because she does not want her identity to be known ; if her father came to know of it he would go once again on a rampage of violence . Insia frankly wants her mother to divorce her father , but mother rejects this idea for the simple reason that she has nowhere to go and has no money of her own . Meanwhile Insia's voice is so melodious that she becomes a youtube sensation who sings behind the veil---the so called secret superstar . And she has a not so secret admirer in school , a boy named Chintan ( Tirth Sharma ) who loves her and whom she soon begins to love back . 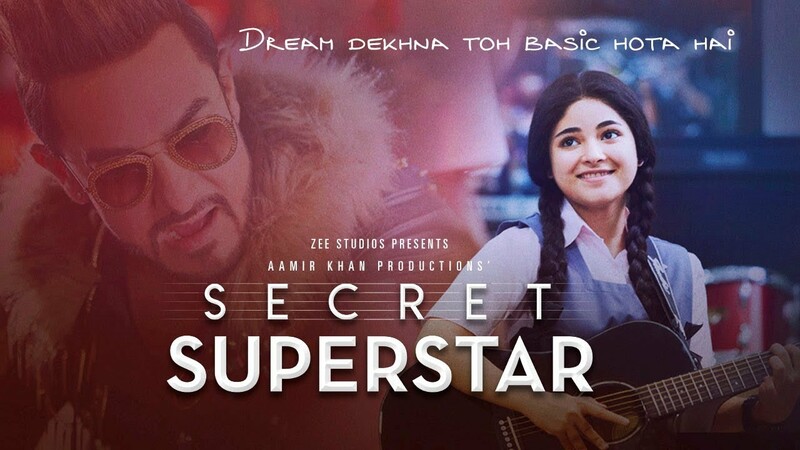 Enter Shakti Kumarr ( played by Amir Khan ) , a quirky crazy music director with a taste for zany songs that match his personality....he wants secret superstar to sing for his songs . And Chintan helps Insia meet Shakti , who is so impressed that he allows the recording to be done in the melodious style Insia wants rather than his style . So will Insia dare to break the veil of tradition to go on the path she chooses by revolting against her father ? Will her mother muster up the courage to go against centuries of tradition to tell her husband on his face that she does not want to go to Saudi Arabia and that she wants to divorce him ? The answer to this is predictable . But the manner in which this happens is emotionally rewarding to see . The maker of the film ( Amir Khan who else ) is a master of striking an emotional connection with the audience . Amir Khan himself plays a comedy role with dialogues that suit his role . He has a quirky beard and a strange sense of clothing . But he does deliver the laughs . Acting by everyone is good . Meher Vij excels as the liberal mother who is trapped in tradition but is no nice that she allows her daughter one outing with her boyfriend before embarking for Saudi Arabia even at such a tender age because she thinks that it might be their last time together . Zaira Wasim looks pretty and acts well as Insia . Insia's father Farookh is played by Raj Arjun , who instills terror without appearing unduly abnormal . Music is the strong point of the film , and the songs are very good if you like them to be melodious ; that's the way I like them at least . Colours and photography is decent enough . Critics could find many flaws in the film , especially about the lack of reason why Shakti Kumarr agrees to help Insia and about how could an obscure singer become an internet sensation in a month without powerful backing . But ordinary folks will like it , and always it is the common man's backing which helps a film get popularity . I see a winner at the box office . Three and a half stars out of five . Have not seen yet,.... Borrowed from a friend,..
After seeing its first trailer, it's pretty easy to make out what the movie is about and where its heading and also what role does Aamir Khan's extended cameo has in this movie. Even when you sit through the first 30 minutes, you can almost guess the climax!!! But what this movie delivers more than a strong message about "Woman's Right To Dream" are the brilliantly well-executed moments. During the first 2 hours, this film carries brilliant moments consistently, its hard to keep your eyes off from the screen even for once. Whether its the moments the mum & daughter shares, the moments featuring a hot-headed unscrupulous dad, the cute romance shared between the kids....you just can keep counting. Such moments ensure that debutante writer/director Advait Chandan really doesn't a lengthy scene to establish anything. Whatever scenes are there, its more than enough!! So instantly you will get connected with the characters and start to empathize Inziya & her mum, Najma and hate the dad, Farookh as much as possible. Personally, the emotional quotient of the movie was simply perfect which adds to the strength of the movie. On a negative side, I felt the climax ended up as a sore thumb. Here the idea was fine (I don't see any other choice myself) but the execution wasn't upto the mark. I hope the makers had taken a leaf from Dangal where you have the cliched, predictable climax but executed in a brilliant manner that it turned out to be one of the best scenes in the movie. Other than that, I really didn't find anything negative regarding the movie's narration and execution. Zaira Wasim as Inziya is the life of the movie and she gave her life and soul to portray the character. But for me the most brilliant performance came from Meher Vij as Inziya's helpless mum, Najma. She got some of the toughest scenes and came out successful with flying colors with her controlled performance. Raj Arjun as the arrogant dad created a terror in the minds of the audience which turned to complete hatred with his outstanding performance. His body language is the highlight for me since he got very few lines to deliver. Tirth Sharma as Chethan was cute and lovable. Last but not least, Aamir Khan's extended cameo was something which I havent seen recently where he portrays and over the top extrovert, eccentric, self-centered music director (His dialogue delivery reminded me of Anu Malik) to almost perfection (as expected). A role which people normally put SRK in mind brought the house down with some terrific comic moments. I wish his character was given a bit more depth but I believe it was kept so in order to keep focus on Inziya and her issues. I really wish the makers make a spin off based on Aamir's Shakthi Kumar!! It has a reallu good scope for a movie!! "Main Kaun Hoon..." & "O Re Manwa" are my fav tracks from this movie. I didn't like the "I Miss You" track which rendered like some nursery school rhyme. This movie is easily recommended as a Diwali Treat and will treat all sorts of audience...... and those who believe in AK, he delivered the a quality product once again...this time more as a producer/mentor than an actor!! according to this reviewer , the movie is nothing but the sob stories of participants of TV programmes like 'indian idol' packaged into a longer version---a movie . in programmes like 'Indian idol' a singing participant comes and tells of his or hers sad story . the judges bring out a few tears to emotionally entangle the audience . and everyone claps loudly for the songs sung by the participant because we have become emotional after hearing the story of how the participant had to struggle until he or she came upto the big stage . all this is a pre packaged formula that the TV channels use for the programmes . the movie just expands it into a bigger somewhat more grander more emotional ( abusive father and all ) version . nothing new in it . I can only applaud for you ashdoc as you really have the guts to go watch all kinds of films!! I saw the promos of this film on TV and was like ... fuuuuckkk.. who wants to watch Indian Idol! !